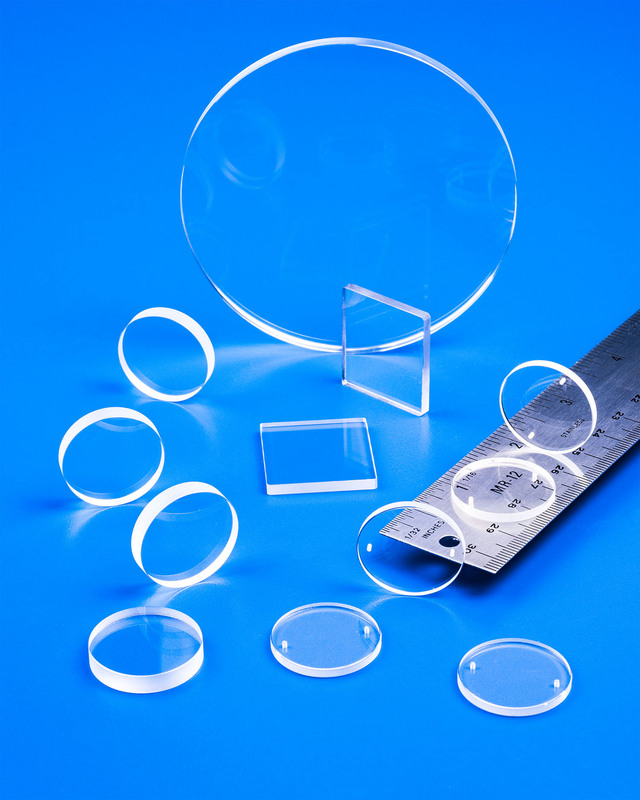 A full line of calcium fluoride (CaF2) optics for use as front surface optics in detectors, sensors, spectrometers, instruments, and lasers are available from Meller Optics, Inc. of Providence, Rhode Island. Meller CaF2 Optics feature a highly polished surface for long life and operate over a broad transmission range with 90-95% transmission uncoated. Offered in 1/4” to 5” dia. sizes, they can be supplied as windows, lenses, and prisms for a wide variety of applications from 0.2 to 9 microns. Custom manufactured to OEM specifications, Meller CaF2 Optics are available as plano-convex, plano–concave, and meniscus lenses and as plane, wedged, and tapered windows. Prisms can include roof types, 90 degree reflecting, 60 degree dispersing, beam splitters, and truncated configurations. Meller CaF2 Optics are priced according to configuration and quantity. Literature and price quotations are available upon request.